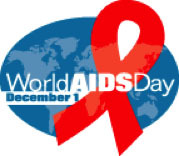 The first year HIV/AIDS Awareness Day was observed was in 1988. The goal is to send a powerful message to the world on the fight against AIDS. According to the timeline of HIV/AIDS, the first recognized cases in the USA were in 1980. After a period of investigation, it was discovered that 300,000 people were infected and it spread to all five continents. All scientific evidence traced the origin of the HIV virus to Africa and is general accepted in the scientific community that HIV is a descendent of immunodeficient virus from a simian. How the virus crossed different species is still subject to discussion with different theories. Science and medicine has advanced greatly since the 1980’s, though we still don’t have a vaccine. People with early diagnosis and treatment can live a normal life. Children from HIV positive mothers can also survive, if the mother had access to treatment and medical care. Women and adolescent are key players to reach a HIV free generation. Since 52% of the newly HIV infected are women, empowerment through sexual education, values or fight against violence for them is a must. Prevention and protection through good health education is the best way not to get infected. To reach a HIV free generation is possible!